De Cordova, Raphael J., lecturer and humorist, born in Jamaica, West Indies, in 1822; died in London, England, April 4, 1901. He removed to New York city in 1849, and was employed in the commission house of Aymer & Co. till 1870. In that year, with his two sons as partners, he established a tea business in New York. The firm was dissolved in 1885, and after 1893 Mr. De Cordova resided in London. During the financial panic of 1857 he turned to the lecture platform, on which he had already achieved success. His subjects were humorous and the lectures very popular. He was a regular contributor to the New York newspapers, and wrote several books, one of which, The Prince's Visit, published shortly after the visit of the Prince of Wales to the United States, had a large sale. He was an expert linguist. Mr. R. J. 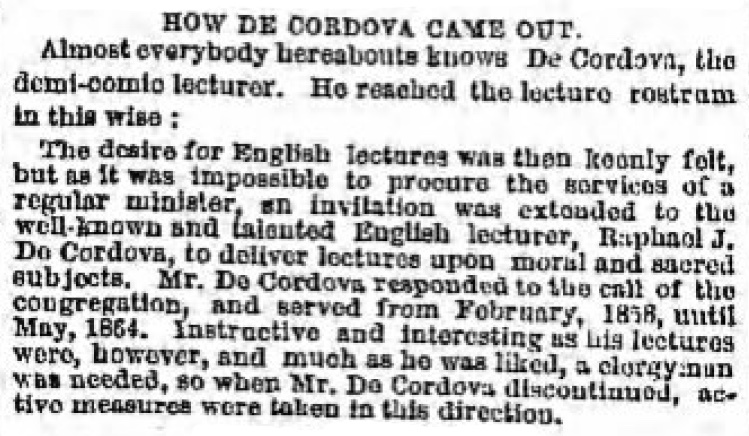 De Cordova, a popular professional lecturer, was engaged to deliver lectures every other Saturday, “the topics to be selected after consultation with the minister.” Although there was sentiment in the congregation that "the lecturer ought to be a theologian,” De Cordova’s tenure extended from 1856 through 1864. It was even thought that Temple Emanu-El had discharged its English-language lecturer, Raphael J. De Cordova, for preaching Jewish political nationalism. Simultaneously, the walls of Temple Emanu-El — which was to become a stronghold of anti-Zionism — rang with the fervent appeals of the preacher Raphael De Cordova for a return to Zion. After several such harangues, Cordova was dismissed by the Temple’s directors. 1860: “Rarely has the ‘opening lecture of the season’ been attended by so large and fashionable an audience as that which assembled at Clinton Hall this evening to greet R.J. De Cordova the popular humorist, and to listen to his new poem entitled a ‘Photograph of Broadway.’ The poem was one of Mr. De Cordova’s best efforts, and can hardly fail of having what the theatrical men term a successful run. All the salient points of the great New-York thoroughfare, -- its crowd of vehicles, and pedestrians, its churches, its theatres, its hotels, its mock-auction shops, its marble stores, its policemen, its dandies, its gamblers and its beggars, -- were hit off in a style at once humorous and sarcastic, that kept the audience in a constant roar of laughter.” Mr. De Cordova was a well-known Sephardic humorist, speaker and sometime investor who was quite popular with New York audiences – Jewish and non-Jewish alike.